In Scotland, the Lowlands and the Highlands are more than just geographical divides. They speak of a history of clashes, traditions, and mystery. The Lowlands, (a’ Ghalldachd in Scottish Gaellic) connote “a place of the foreigner”. This is where the modern cities, Glasgow and Edinburgh, the capital, are located. Because these are nearer to Britain, commerce and trading flowed easily to the receptive Lowlanders. The once flat terrain developed into bustling cities now known for their modern architecture. In stark contrast, the Highlands, (a’ Ghàidhealtachd in Scottish Gaelic) refer to “the place of the Gaels”. This is known for glacial rock formations along side lush green valleys, and lochs that I suspect they could turn even the most cold-hearted person into a sentimental fool. To me though, what distinguishes the Highlands from the rest are the dramatic climate, the leery yet exciting sightings of mythical creatures, the stirring stories of warring clans, and its intriguing history of resistance. Being a tourist, I did not want to play my part all too well by just staying in Glasgow and Edinburgh like most people. After downing several Scotch ales at a cliché corner pub in Edinburgh, I found myself emboldened with Scottish bravado. I resolved to get myself to the Highlands on one of those Isle of Skye tours. All I needed now was the determination to get myself off the bed in time for the early morning bus. I wanted to down my pint and head home but then I figured, it would have been an insult to my £5 Scotch ale. I sipped the last of my liquid courage slowly, eagerly plotting my Scottish adventure. I managed to wake up early, sans hangover. The day was seemingly calm for July weather. It was as if the sky was a blue canvass and the white brushstrokes of clouds were the only colors in the world. Armed with stories from other travelers and what little Internet research I was able to make, I boarded the bus and found a seat next to a window, eager for the three-day journey up the Highlands. The bus ride in itself was already a treat. The bed of green plains started to morph into rolls and mounds of varying shapes, at times like a baby bump and at others like a behemoth on its deathbed. It was almost as though the landscape was subtly telling this non-Gaelic, this total foreigner, that in the Highlands, a straight line is a playground for your imagination. We traveled alongside the running waters of River Tay, the longest river in Scotland. The bus had a quick stop at Dunkeld, a small town just before the border into the Highlands. Even before I stepped off the bus, the turrets of Dunkeld Cathedral loomed before me; clearly it was the town jewel. I was told that the cathedral served as one of the main battlegrounds during the Battle of Dunkeld in 1689. As I looked around the church’s cold and hallowed halls, I could almost see the Jacobites, (clans from the Highlands loyal to the deposed Catholic King James VII of Scotland) and the Cameronians, (a Scottish infantry led by the British), fighting to the death, engaging in the bloody dance of war for the newly crowned Protestant William of Orange. “They could fight against men, but it was not fit to fight any more against devils”. Amusingly, our tour guide cheekily hinted that the reason for the Highlanders’ departure was not as dramatic: he surmised that they had left Dunkeld simply because the town ran out of Scotch ale. Whatever reasons they may have had, it was because of their departure that the Cameronians declared victory. The battle became a turning point in the reign of William of Orange. Once merely a Dutch monarch, he now ruled as the king of England, Ireland and Scotland. Traveled the world; above and underwater. Lived a life not ordinary. Leaving Dunkeld and heading further north, it was not long until rocky mountains crept into the skyline. Shaped by the ancient glaciers, the landscape of the Highlands quietly told of its long history, as though they were saying, “I was here during the ice age; and I will remain until the next one.” The massive rock formations are a perfect backdrop for the lush vegetation that seemed infinite to the eyes. As the bus’s tires crossed a telltale road crack, my goal was met. It was official; I crossed the Highland Boundary Fault, the fault line that divides the Highlands from the Lowlands. We rolled by a signpost greeting, “Welcome to the Highlands”. At the bottom, there was the Scottish Gaelic translation “Fàilte don Ghàidhealtachd” (Faal-chuh don ah-ghale-takh-k). Don’t worry. Nobody can pronounce it correctly. If I asked you to name famous people from Scotland, I bet you a bajillion bucks that Sean Connery, Ewan McGregor and Mel Gibson would top your list. Oh wait, I meant William Wallace portrayed by Mel Gibson in the movie Braveheart. But to tell you the truth, they have nothing on the most famous Scot in the world: Nessie, the Loch Ness Monster. In a country filled with lochs, it is no surprise that the Loch Ness Monster has mystified the Scots, along with the rest of the world. Often described and depicted as a prehistoric creature, tales of spotting its long brontosaurus neck and webbed fins has haunted locals and tourists alike. The story goes that sightings of Nessie date as far back as the 6th century. It was only in 1933 however that it was first written about on the newspaper. The buzz about Nessie again resurfaced when a surgeon presented an alleged photograph of the creature, but of course, skeptics have labeled it a hoax. As a realist, I would put Nessie in the same class as the Yeti of the Himalayan Region and the Bigfoot of North America. 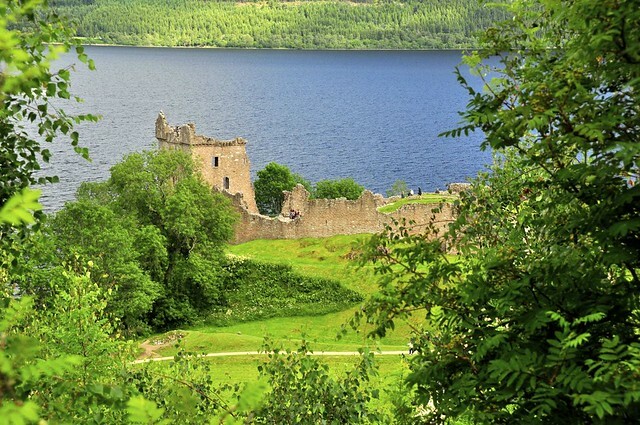 On a promontory at the banks of the Loch Ness, the ruins of Urquhart Castle stand proudly over the lake. Built in the 1200’s as a stronghold, what remains of the once glorious structure has become the prime location for spotting Nessie. I wandered around the castle and realized that quite a few were actively looking for a spotting of Nessie. Having dragged myself this far, I myself glazed upon the loch for several minutes, with my camera on hand. But, as fate would have it, I left the place empty handed. If only I didn’t close my eyes for that one split second, who knows what I would have seen? I was growing tired from the ride en route to the sites when the bus again stopped at Eilean Donan Castle (Island of Donan Castle). As the name suggests, the castle sits on an island in the middle of Loch Duick and is connected by a stone bridge to the riverbanks. It is one of the few reconstructed castles in Scotland that have been fully restored to their former glory. We went in but unfortunately photography isn’t allowed inside but it was beautiful and is a popular venue for weddings. We then set towards the east. We arrived at the village of Kyleakin and settled in our hotel. We then headed towards the local pub for dinner and have a pint of the Black Cuillin (local beer) before calling it a day. All spruced up by the promising day, I boarded the bus bound for the northern tip of the Isle of Skye. The rocky mountain formations seemed to grow bigger and higher as we went farther up north. Rising from the sea at more than 3,000 feet, the intruding Cuillin Mountain Range, named after a Celtic warrior, marked its territory with two imposing ridges. The Black Cuillin is composed of dark colored basalt and gabbro rocks, leaving the jagged mountain barren. On the other side, the Red Cuillin are lower rounded hills made of granite with a shade of red is teeming with flora and fauna. Passing through the Cuillins, I listened to the folklore about a young boy whose face was wounded by tree branches after running into the forest to escape a symbolic battle between the two sexes. It was said that the boy stumbled and fell into the stream, which arose the curiosity of the faeries that inhabit the area. The faeries asked the young boy of his troubles and found his story amusing. Before disappearing, the faeries told the boy to go home and bring knowledge to the warriors. The boy headed home and upon passing another water, he saw his reflection and saw that his youthful face was restored. He got enlightened and gathered hazelnuts for cooking of which it’s aroma reached the warriors who retired to eat at the same table, only to learn that men and women are equals. I would have to add that by sheer timing, the bus stopped near the stream where the young boy supposedly fell. Glistening water ran down the stream and flowed into the middle of a valley. 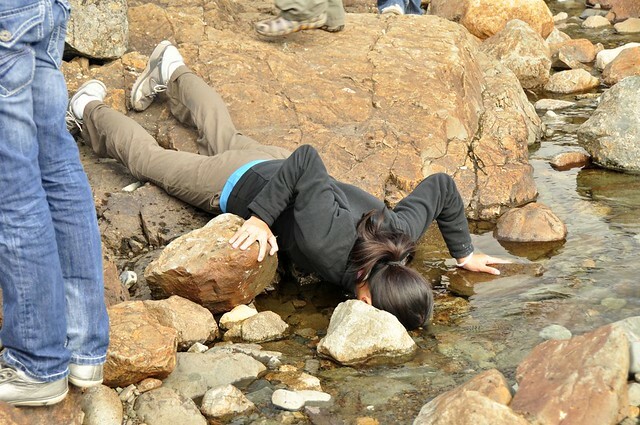 Naturally, I took upon the chance to dip my face into the crisp running water. As I pulled my face out, with water still dripping, I felt a brush of the Highlands breeze touching my face. It was chillingly cold and I was refreshingly mystified. Armed with a beanie and a scarf, I prepped myself to hike the Storr. I followed the beaten pathway that cuts through an eerily thick row of pine trees where only a quota of light is allowed. Emerging from the gloomy pathway, and like a curtain opening for a show, stood a seemingly misplaced rocky hill surrounded by green slopes, the Storr. I continued the hike until I reached the Sanctuary and found hulking shapes of boulders and pillars. Off the horizon, I spotted the towering and rugged Old Man of Storr, the most popular pinnacle on the Storr. 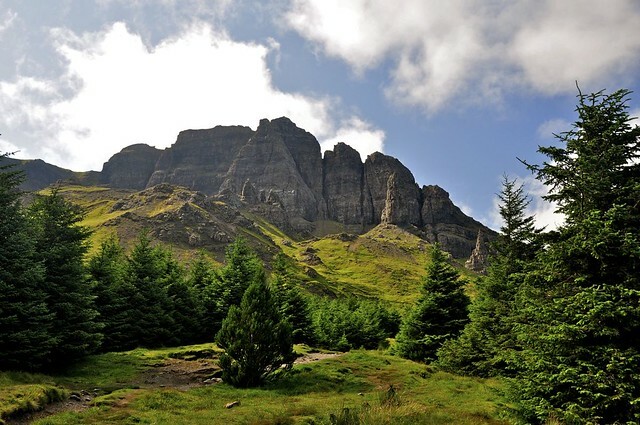 Legend has it that an old couple went up the Storr to search for their lost cow, instead, they saw giants and as they fled, they looked back and turned into stone. Arriving at Uig, a village far up north, the last stop for the day was at the quirky scenery of the Faerie Glen. The landscape is filled with miniature grassy, cone-shaped hills, where a walk through its mystic land revealed uncharted slopes with moss-covered rocks. Strange enough, it was said that faeries formed the hills out of rocks and used it as their treasury. I imagined the hills to be a village inhabited by dwarves or hobbits with chimneys stuck on top. After several minutes of treading the path, the ruins of Castle Ewen, emerged from the skyline, overlooking the outlandish panorama, a fitting end to a day filled with stories from a different land. On a third streak of a bright clear Scottish day, we headed back south and down on memory lane when the Highlands was ruled by kilt wearing clans brandishing their own coat of arms. 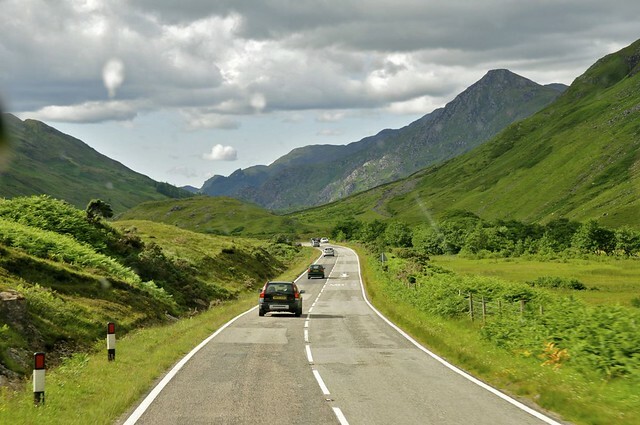 The beautiful scenery of Glen Coe, meaning “Valley of Weeping”, is admired for its revering scenery and is known as a haven for outdoor enthusiasts. The valley, surrounded by precipitous mountains, lies a grim past of clan wars. In the winter of 1692, the clan Campbell sought shelter from the clan MacDonald who owned Glen Coe. Honoring the Highland hospitality code, clan MacDonald welcomed the clan Campbell. After 13 days, clan Campbell, acting under the command of William of Orange, killed notable members of the clan MacDonald while they slept through a blizzard. The incident is forever remembered as the Massacre of Glen Coe. As I surveyed the area, I chanced upon a small number of Highland cattle, fondly called “hi-lan coo” grazing within. Though in their natural environment, they stood out. They looked like huge stuffed animals feasting in the middle of the valley. 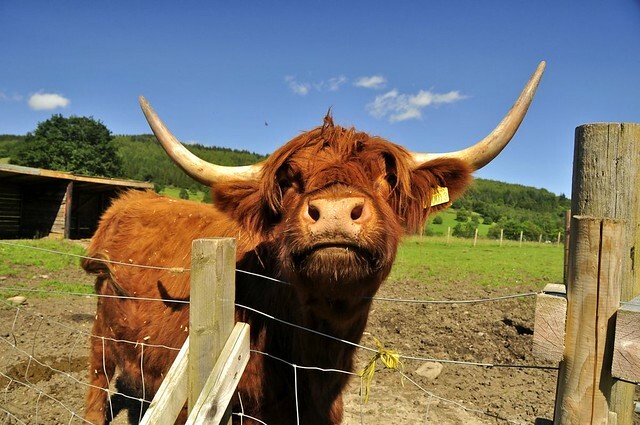 With thick flowing coats of wavy red hair and wide intimidating horns, the Highland cattle are easily THE ROCKSTARS of all the other cattle breeds. Traveling to the Isle of Skye is not for the faint of heart, but for the young at heart. 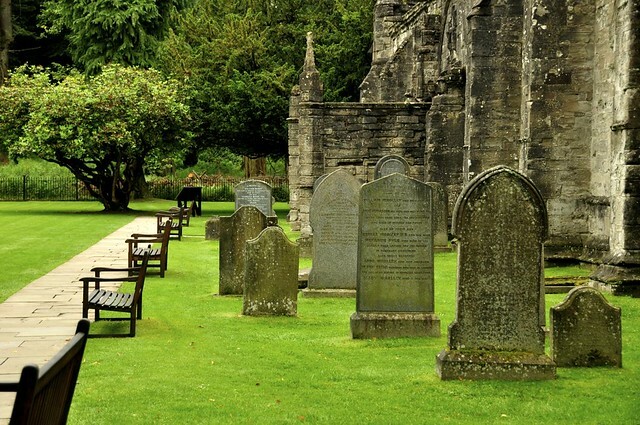 From the historical battles at Dunkeld, to the mythical prehistoric creature known as the Loch Ness Monster, the Scots will never run out of stories to tell whether it be on land or under water. Actually, you will never run out of things to say in this country with a pint of Scotch Ale on your hand. 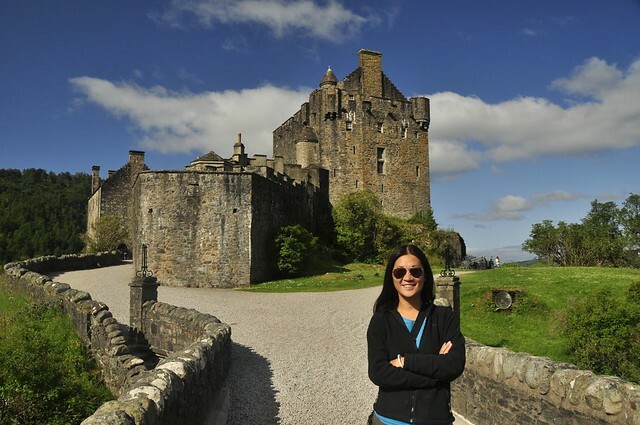 * This is a backblog – I was in Scotland July, 2011. So stunning. Definitely going to add this to my list of things we want to do with the family in the next few years. So glad you are willing to share your pictures..thanks! I would love to get up to the Highlands and the Isle of Skye at some point. It looks and sounds like another world. Hi! Awesome photos… Scotland looks so beautiful. Also, the fountain of youth tale is quite interesting. Thanks! It really is so beautiful. I’m so glad to have a second look at it.